When the world is descending into chaos, it can be hard to believe that optimistic visions of the future are within our reach. But personally, I think I’ve hit that point where escapist fantasy worlds of tomorrow are the only thing that can ease the stresses of our modern world. This 1923 illustration, for instance, is a picture that I’d just love to crawl inside of and pretend is real. I scanned the image from the October 1923 issue of Science and Invention magazine. 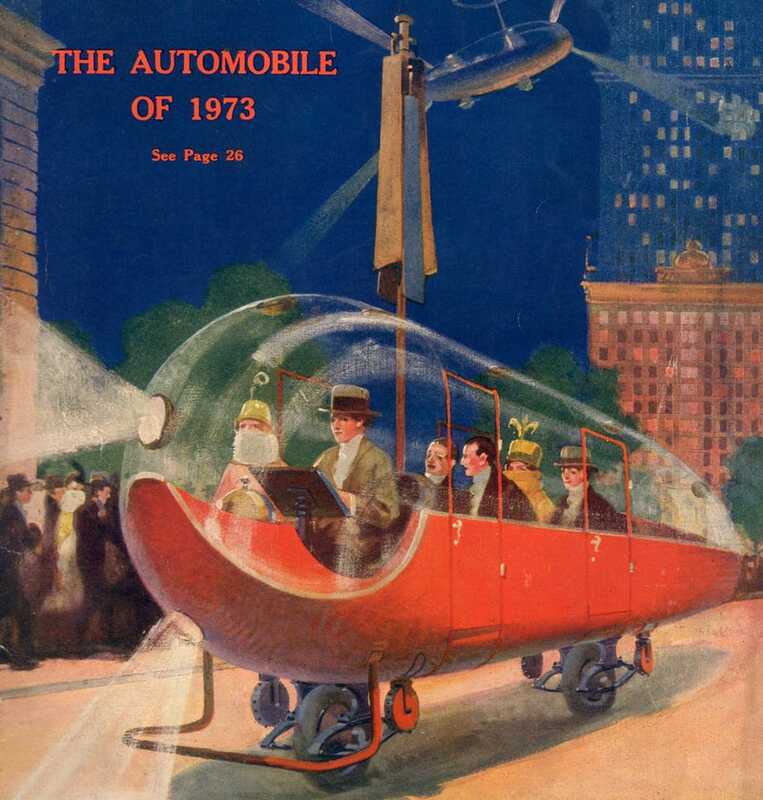 Published by the legendary science fiction pioneer Hugo Gernsback (1884-1967), Science and Invention gave Americans of the 1920s an earnest take on what the future might give us. While the magazine would sometimes have a sci-fi story or two, these depictions of tomorrow were published alongside news about cutting edge science and technology of the day and predictions about how those technologies might be applied. This particular vision of the city of tomorrow was illustrated by Louis Biedermann (1874-1957) and was clearly inspired by European visions of what civilised life could look like. 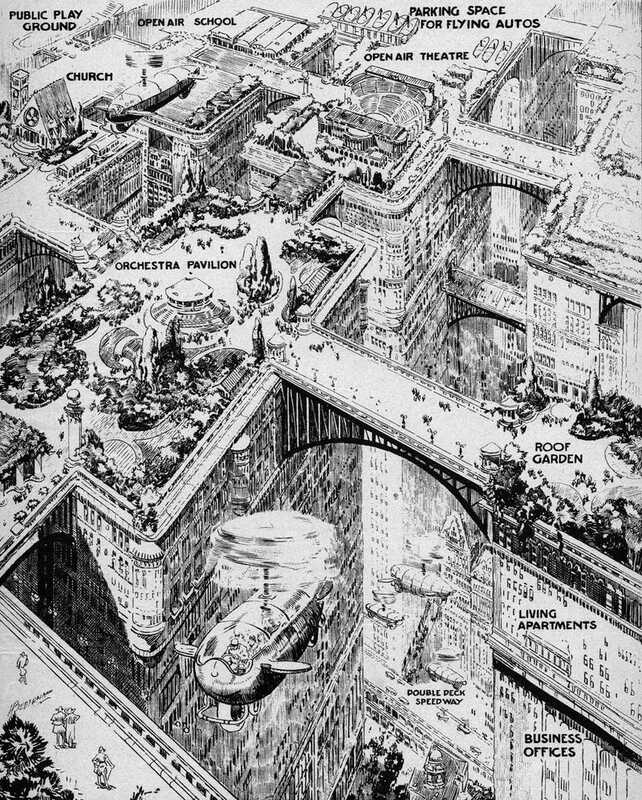 Gernsback, an American originally from Luxembourg, took many of his ideas about what hypermodern futuristic cities could look like from Europe and mashed them with a very New York sensibility. There are enormous skyscrapers and wide pedestrian bridges that connect every building, but the tops aren’t filled with just cold, futuristic advancements. No, the roofs are utilised for the most human and organic of endeavours—from gardens and orchestra pavilions, to playgrounds and open air theatres. Gernsback was never afraid of presenting over-the-top techno-utopianism, so it’s a very conscious move on his part to provide these human touchstones of livability. There’s even a church, and an “open air school” sitting atop the skyscrapers, all symbols of the public good, rather than privatised spaces; an idea that’s perhaps foreign to a lot of us in this era of greed and malice. The text that accompanies the illustration, written by Gernsback, specifically calls out its European inspiration. In Europe, as a rule, people do not travel to and from business, taking from 15 minutes to an hour on an average in doing so. Usually they live near their place of business, and often just over them. The illustration shows an American city of the future which will do away with the useless travelling which nearly all of us do to-day. At present, this travel means a huge loss of time. It means car fare and inconvenience. In the future, the cities will be laid out with business buildings covering entire blocks as seen above. Atop these will be apartments where people will live. The parks, restaurants and landing places for airplanes, will be on top of the apartments. The top levels will be connected by bridges. The advantages of this plan are so huge it is surprising the idea has not been tried, as yet, on a large scale. To be sure, in New York, there exists to-day many roof gardens up which even large trees grow. With all the flying car designs that keep popping up in the news, why can’t they make one that looks as cool as this? I suppose it’s for the same reason that we can’t get a city that looks this cool either. America hasn’t even figured out how to give its people the most basic necessities like common sense gun control measures or universal health care. I guess, for now, we just have to keep dreaming.